Fruit medley from Jackie Chan’s Action Kung Fu, by NOW/Hudson. 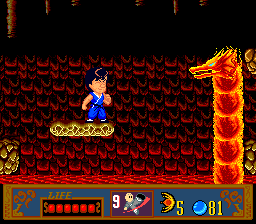 Jackie Chan’s Action Kung Fu was first released for the NES in 1990 but is probably better known for its 1991 TurboGrafx-16 release. As an NES game it was kind of lost in the shuffle of the large number of games on that system but it stood out more among the TurboGrafx-16’s fewer releases. Also, the graphics were greatly improved on that system. Jackie Chan wasn’t really a household name in North America until the release of Rush Hour in 1998 (looks like they are working on a Rush Hour 4 now!). Fans of the martial arts films he was known for may have been familiar with him but I don’t know how much the use of his name really helped sell this game. The large sprites used in this game were kind of unique and I think people tended to love it or hate it. Having said that, the game itself is surprisingly good. 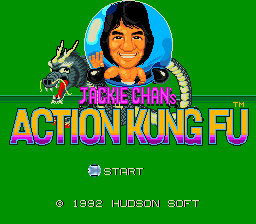 Jackie Chan’s Action Kung Fu is a fairly typical side-scrolling beat-em-up. The graphics were better than anything available on the NES at the time and the game play was pretty good too. Action was fairly simply with just one button for jumping and another for attack that could be combined for more complex moves. Special moves could also be collected through the course of the game. The story involves Jackie Chan’s sister being kidnapped by an evil sorcerer. 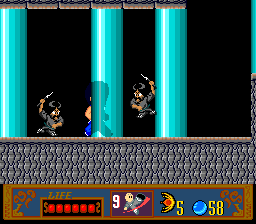 As Jackie Chan, you must battle your way through his minions until finally battling the sorcerer himself and rescuing your (Jackie’s) sister. If you have a TurboGrafx-16, this is definitely a title that you may have overlooked and should pick up if you did. It came out for the NES also but it really shines on the TG-16. But holy crap it’s expensive on eBay! I seem to remember this being one of the more common games once upon a time…It might be best to stick with emulation for this one unless you are a serious collector and want to shell out the big bucks. I don’t think this one has had any official re-releases or any sequels.